Hello everybody. Me had such a great day today in Delft. No, me did no historical sightseeing – Frights (you know her from me Instagram account) was doing those honors – me went to the Spa! Yes a true Spa, just for cuddly, fuzzy creatures like me. 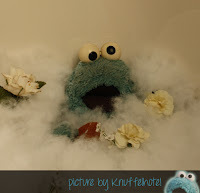 It is called Knuffelhotel (Plushiehotel) and is ran by Doctor Anneloes. Yes she is a real Plushiedoctor and Beautician, and really sweet. Let me tell you a little about our day. This morning Berry and me got up REAL early to catch the 8 o’clock (AM!) train to Den Haag (The Hague). Luckily we no did have to wait long for the bus and even the train was on time. At The Hague we transferred to the Sprinter (also a train) to Delft. After a short walk we arrived at the Knuffelhotel. Me was really excited and looking forward to it, because me love a day for me own. Berry was a little nervous, but the sweet doctor made the nerves disappear real quickly. She was so nice! Me could stay in one of the Hotelbeds with Nurse bunny before Berry left and then me had the best day! Me got tea and Stroopwafels (really nice Dutch cookies!) in bed. O that was so good! 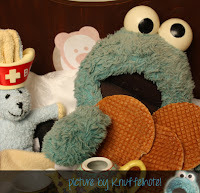 Me was so spoiled, because me had a Stroopwafel with me all the time. Me was washed and took a long bath. Me played with rubber duckies (me thinks they liked me, they were sitting on me face and quacking) and even got some curlers in to get me bouncy fuzzy and blue fur back! Doctor Anneloes took these pictures of me in the Spa. It was lovely! Me is really refreshed and spoiled! It just a few pictures though. Me will share more of them on me Instagram and Facebook pages soon. At 5 pm Berry was back from her day in Delft to pick me up. 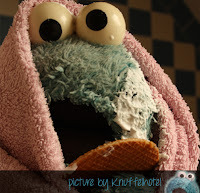 Me was sitting on the counter being fuzzy and blue (and naked hihi) and the first thing she said: ‘O! You are SO BLUE and fuzzy!’ Yes, me just look 14 years younger right. 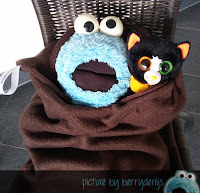 Me was glad Frights had been out and about around Delft, so she snuggled with me on the way home in me own Knuffelhotel sleeping bag. 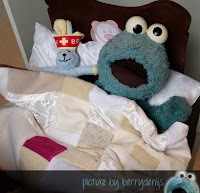 These pictures were made by Berry again. 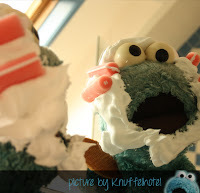 Me had a great day at Knuffelhotel in Delft. 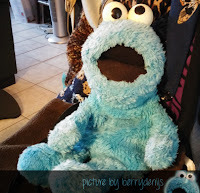 If you have a plushie that needs to be bathed, pampered or repaired (yes me had a little rejuvenating surgery done too) than this is the place to be. Doctor Anneloes is so nice, you truly feel good about leaving a beloved friend for the day (or a few days). Thank you again Doctor Anneloes! Me had a great time. And when it is necessary me will come back again. For sure! Your friend Sid here! This is so much fun! My mama is a toy doctor too occasionally. You seems had a LOT of fun! 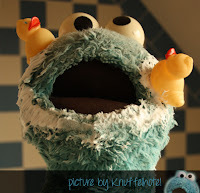 :D I love your blog, Cookie! Very well done! You are welcome! Me really love your follow too. 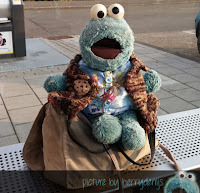 Hi Cookie - great picture and story - I love your accounts ( Facebook Instagram and your blog - well done very well done! Me love your stories too.